The unusual structure of the dithionite anion. It has a remarkably long sulfur-sulfur bond. A ball-and-stick model of the dithionite ion. 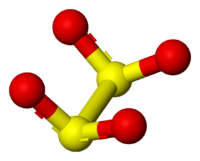 The dithionite anion ([S2O4]2−), is an oxoanion of sulfur  formally derived from dithionous acid, H2S2O4. The sodium salt of dithionous acid, sodium dithionite, finds widespread use in industry as a reducing agent. Dithionite is often used in conjunction with complexing agent (e.g., citric acid) to reduce iron(III) oxy-hydroxide into soluble iron(II) compounds and to remove amorphous iron(III)-bearing mineral phases in soil analyses (selective extraction). 3) is well known to induce pitting corrosion while dissolved free sulfide (Na2S) is responsible for stress corrosion cracking (SCC). ↑ International Union of Pure and Applied Chemistry (2005). Nomenclature of Inorganic Chemistry (IUPAC Recommendations 2005). Cambridge (UK): RSC–IUPAC. ISBN 0-85404-438-8. p. 130. Electronic version. Wikimedia Commons has media related to Dithionites. This article is issued from Wikipedia - version of the 5/2/2014. The text is available under the Creative Commons Attribution/Share Alike but additional terms may apply for the media files.